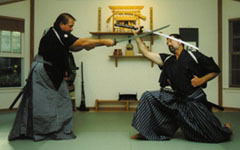 Iai jutsu is the rapid deployment of the sword with combative intent. It is a separate area of study with it's own distinct waza. As a classical art Iai jutsu concerns itself with three primary considerations, combat application, mental and physical discipline, and morals. The ability to rapidly and fluidly draw the sword and successfully engage an enemy was crucial to the samurai both in attack and defense. The techniques for accomplishing this feat are sophisticated and take serious instruction and practice before they can be done safely at speed. 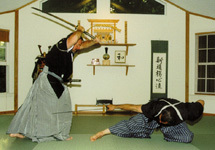 At the Dojo of the Four Winds sword arts are done with live (read real and sharp) swords. The fact that the student is using a real weapon facilitates both the speed and the depth of learning. Subtle physical and mental interaction become second nature and both awareness and function are enhanced. At the higher levels of skill the opponent is controlled with the swordsman's will and is unable to attack without being cut down in the process.